Space station veteran Timothy Kopra, scheduled for launch Feb. 24 aboard the shuttle Discovery, was injured in a bicycle accident Saturday, a NASA official said. The injury was not life threatening and the NASA official, citing medical privacy issues, provided no additional details. But multiple sources said Kopra may have broken his hip, raising the prospect of a significant impact to the already-delayed mission. In training to serve as flight engineer for launch and entry, Kopra also is the mission's lead spacewalker for a pair of excursions outside the station. He and his crewmates have been in training since September 2009. "Tim Kopra was injured today in a bicycle accident, but he will be OK," the NASA spokesman said in an email exchange. "However, there could be an impact to his mission duties for STS-133. That concern is still being evaluated. Further details of his injury are not available at this time due to concerns for his medical privacy." NASA does not train backup crews and a replacement, even a recently flown veteran, would need time to rehearse spacewalk scenarios and receive mission-specific training for Discovery's flight. How long that might take, if required, and what impact it might have on the shuttle's launch date is not yet known. With only three shuttle missions remaining before the fleet is retired, the accident marked a difficult personal setback for Kopra. In years past, an astronaut who had to miss a flight for medical reasons could look forward to being worked back into the crew rotation for launch on a future flight. But with only two and possibly three missions left, there are no available seats and depending on the nature of his injury, Kopra could be forced to sit out the shuttle's closing stanzas. Originally scheduled for launch Nov. 1, Discovery has been repeatedly delayed because of cracks in structural ribs, or stringers, in the ship's external tank. NASA managers announced last week that an engineering analysis had finally revealed the root cause of the cracks and that a relatively straight-forward modification was expected to clear the way for launch Feb. 24. Discovery's delay, in turn, forced NASA to push back the shuttle Endeavour's launch on the following mission from late February to April 19. But any significant additional delay for Discovery would cause a domino-like slip for Endeavour as well. Earlier this week, NASA announced that a backup commander -- Frederick Sturckow -- would begin training with Endeavour's crew in place of Endeavour commander Mark Kelly, whose wife, Rep. Gabrielle Giffords, was critically injured in a Tucson shooting spree Jan. 8. Kelly remains the mission commander and said in a statement Thursday "I am very hopeful that I will be in a position to rejoin my STS-134 crew members to finish our training." Born in Austin, Texas, Kopra is a retired Army helicopter pilot who served in Operation Desert Shield and Desert Storm. He attended U.S. Naval Test Pilot School and was selected to join NASA's astronaut corps in 2000. Kopra has flown in space once, blasting off aboard the shuttle Endeavour July 15, 2009, and serving three months aboard the International Space Station before returning to Earth with the crew of the shuttle Discovery on Sept. 11, 2009. 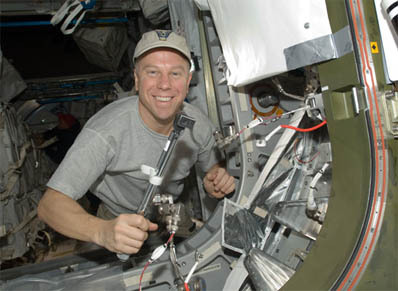 During his stay aboard the station, Kopra completed a five-hour two-minute spacewalk. Kopra was named to the crew of shuttle mission STS-133 in September 2009, along with commander Steven Lindsey, pilot Eric Boe, Alvin Drew, Michael Barratt and Nicole Stott. Barratt and Stott also are space station veterans. At that time, NASA intended Discovery's flight to be the program's final voyage, following a Bush administration mandate to finish the space station and retire the shuttle fleet by the end of fiscal year 2010. That somewhat arbitrary deadline was relaxed a bit when Congress, worried about the possibility of schedule pressure on flight safety, promised an additional $600 million in funding to cover shuttle operations through the end of calendar year 2010. NASA managers later said internal cost-savings initiatives would allow shuttle operations to continue into early 2011 if necessary. As it turned out, problems with a $2 billion particle physics experiment scheduled for launch aboard Endeavour during the next-to-last fight in July 2010 forced NASA to revise the end-of-program shuttle manifest. Because of work to replace the powerful magnet in the particle physics experiment, Endeavour's flight leap-frogged Discovery's, slipping to late November and eventually to Feb. 27, 2011. Discovery's flight, in turn, slipped from mid September to Nov. 1, in part to accommodate work to modify a cargo transport module for permanent attachment to the space station. Discovery ran into a variety of technical problems, slipping from Nov. 1 to Nov. 5. A launch try that day was called off because of a gaseous hydrogen leak. That problem was resolved, but the crack issue surfaced in the wake of the scrub, eventually delaying Discovery's flight to Feb. 24 and Endeavour's to April 19. NASA hopes to close out the shuttle program this summer with a final flight of the shuttle Atlantis. The official embroidered crew patch for shuttle Discovery's final flight is available in our store. Free shipping to U.S. addresses!